Using the PXSe and the LayGO® Multiprotocol Toolkit as the hardware and software platforms respectively, Advanced Relay has developed a series of products to perform the collection of CDRs in a completely autonomous way. All of these solutions are based on the ideas explained in the FTAM gateway page. Whether your CDR collection need is listed here or not, contact us. It is very likely we can provide you with a cost-effective solution! Automatic File Transfer (AFT) is a protocol used by Nortel Networks to download billing data from their DMS-100 model telephone switches. For more information please check AFT over X.25 in the PXSe Telecom Manual. The Automatic Message Accounting Teleprocessing System (AMATPS) is a protocol designed by Telcordia Technologies (formerly Bell Communications Research, better known as Bellcore) for downloading billing data over X.25 from telephone switches such as the Lucent 5ESS. Advanced Relay's implementation conforms to the AMATPS specification as described in Telcordia Technologies Generic Requirements GR-385-CORE, Issue 2, October 2001. For more information please check AMATPS in the PXSe Telecom Manual. The Billing Media Converter (BMC) application is designed to download AMA billing data over a IBM 3780 BISYNC data link from Siemens Stromberg-Carlson Digital Central Office (DCO) telephone switches through the Binary Synchronous Communication (BISYNC) Central Office Data Collector (CODC) interface. Advanced Relay's implementation conforms to the BMC specification as described in the BISYNC CODC Host Collector Interface OLS-2020-001 dated April 18, 1991. For more information please check BMC in the PXSe Telecom Manual. The Data Acquisition System (DAS) is a protocol designed by the Motorola for remote file manipulation. DAS is sometimes used to download billing data over HDLC LAPB from EMX-100, EMX-250, EMX-500 and EMX-2500 telephone switches. Advanced Relay's implementation conforms to the DAS specification as described in the DAS Output Tape Programmer's Guide 68P81055E32 dated April 28, 1986.For more information please check DAS in the PXSe Telecom Manual. 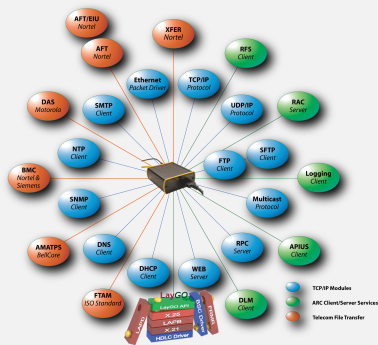 The File Transfer, Access and Management (FTAM) is a protocol designed by the International Organization for Standardization (ISO) for remote file manipulation. FTAM is sometimes used to download billing data over X.25 from telephone switches, such as the Siemens EWSD, Ericsson AXE and Alcatel S12 switches. Advanced Relay's implementation conforms to the FTAM specification as described in ISO 8571: 1988 (E). For more information please check FTAM in the PXSe Telecom Manual. The Remote Data Polling System (XFER) is a protocol designed by Nothern Telecom for downloading billing data over X.25 from telephone switches in the DMS-100 family. Advanced Relay's implementation conforms to the XFER specification as described in Document Number AA03 dated August 27, 1996 entitled XFERPRO: Data Transfer (XFER) Application Protocol, Technical Description, Release 4.0. For more information please check XFER in the PXSe Telecom Manual. For more information, please check this presentation.